New Issue Topic for 2016: Women & Girls! In 2011, the United Nations declared October 11th an annual “International Day of the Girl Child.” We are dedicating the mid- year 2016 issue of ANS in anticipation of the October 2016 international observance focusing on girls. We seek manuscripts that address nursing perspectives on health care for girls and women, their families and communities. We welcome research reports that provide evidence for nursing practice, theoretical and philosophic perspectives, or methodologic issues related to investigating health issues and nursing concerns for women and girls. We particularly welcome manuscripts with an international focus. Visit the ANS web site any time to see all of our projected issue topics – but to save you a an extra web-trip, here is the current list! As nations worldwide seek to establish models of care that provide quality and efficiency, nurse leaders are emerging to play a significant role in the development of these models. For this issue of ANS we are seeking manuscripts that provide theoretical underpinnings of creative models of care, as well as evidence that supports their implementation. Manuscripts should be clearly grounded in a nursing perspective; the content can include philosophic, theoretic, empirical or ethical aspects related to the model. For this issue of ANS we are seeking manuscripts that provide methodologic innovations that bring nursing theory, research and practice together, including translational research, emancipatory and participative approaches. Nursing research reports of studies using these methodologies are welcome, as are manuscripts that provide philosophic, theoretical or methodologic explanations of these approaches to scholarship. Manuscripts should include a strong emphasis on the development of nursing as a discipline. Given recent history of international conflict and violence, the health and well-being of those who have served the military of any country world-wide has become a major challenge that influences the well-being of families, communities and nations. For this issue of ANS we seek manuscripts that address nursing perspectives on health care for veterans, their families and communities. We welcome research reports that provide evidence for nursing practice, theoretical and philosophic perspectives, or methodologic issues related to investigating health issues and nursing concerns for this population. Nursing, of necessity, has adapted over the past half century to the burgeoning presence of technology that has been developed for the diagnosis and treatment of sickness and disease. 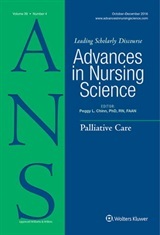 For this issue of ANS we seek scholarly works that extend the critical analysis of technologies from a nursing perspective, and works that provide evidence upon which to build nursing practice in ways that balance the use of appropriate technologies with the person-to-person relationship and caring that is central to nursing practice. We welcome articles that present empirical research, philosophic analyses, and development of theoretical models that inform the appropriate use of technology.